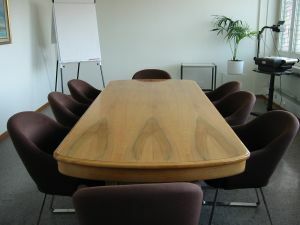 If you are prone to sit quite meekly in meetings with hands in your lap, or well back from the table, you may be putting yourself at a distinct disadvantage. As Lois P Frankel says in ‘Nice Girls Don’t Get the Corner Office’, normal table manners don’t apply in business situations. You CAN put your elbows on the table! Look really involved in the conversation by leaning forward slightly with your forearms on the table, hands lightly together. You are also in a good position to gesture that you want to speak as well. The head of the table need not be reserved for the eldest and most senior male in the family. Try sitting there once in a while, don’t assume you must take a less significant seat. If you can, sit next to the most powerful and influential person in the room (without looking too needy and sycophantic obviously!). Sometimes the power stardust rubs off, and certainly people will tend to look in your general direction, which again gives you opportunities to contribute more.